Click here to view poster full size. Learn to Irish step dance or at least watch! Native Minnesotan Jannet Walsh is a blogger, columnist, journalist, photojournalist, terrier owner, hula hooper and more! Contact her at jwalsh@wctrib.com Click here to view full biography. View her other blog at http://jannetwalsh.blogspot.com/. 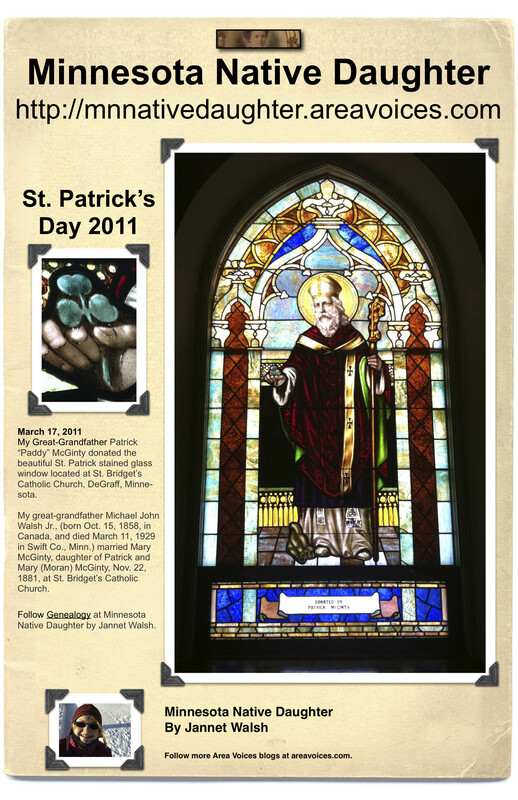 This entry was posted in Blogging, Family, Genealogy, Minnesota, Murdock, Patrick McGinty and Mary (Moran) McGinty, Religion, rural, Saint Patrick, St. Paddy, St. Patrick and tagged De Graff, family, Genealogy, religion, Rural, Saint Patrick, St. Patrick, Travel on March 17, 2011 by Jannet Walsh.